SupplyDivision (Stockholders), trade and wholesale suppliers of soft, acrylic herringbone/twill weave webbing tape. We can supply many of our tapes, elastic, ribbons and webbing in cut lengths to order. If you cannot find exactly what you require please email us with the details. 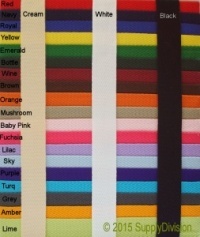 12mm soft Polyester/Acrylic twill webbing 200m reels. 25mm Acrylic Twill webbing tape.